If you’re serious about using social media to grow your business, you need to spend less time on social media. A contradiction? Not necessarily…. It’s easy for startup and small businesses to get on social media, post a few bits of content, and end up spending an hour browsing, commenting, liking. It’s fun, right? After all, these brains behind the likes of Facebook, Twitter and Instagram have designed their platforms to have that sort of addictive quality about them. But that’s not always time well spend when it comes to your business, because it doesn’t pay the bills. Sure, you may be gaining followers, but don’t trip up in thinking that followers = revenue. So, what’s the solution? You need to plan out your content in advance, and invest in a scheduling app that’s going to do all the legwork for you. Here are 10 of the best scheduling apps around for Instagram. Tailwind is the tool that I currently use, so it has my personal recommendation. One of the main reasons I use Tailwind is because they have one of the best hashtag recommendation tools on the market, and when using their app it’s very easy to schedule a post and pick the best performing hashtags from a list they present you with (see the screenshot below of “suggested hashtags”). Crowdfire is the scheduling tool I used to use for Instagram. If you’ve read some of my old case studies you’ll know I had great success growing my Instagram account quickly using Crowdfire (note those features aren’t available any more as Instagram has changed their API to restrict what third party apps are able to do), and I still do love it (I still use it daily for Twitter and it’s excellent). I switched to Tailwind purely for the better hashtag feature, but Crowdfire is still a fantastic tool, and the team behind them are working really hard to add new features to their app all the time so I’m excited to see what this tool can do in the future. If you want a beautiful-looking feed like this one below, then Planoly is the tool for you. Planoly allows you to visually plan your feed, which means you can drag and drop you posts into different positions to see what they’ll look like once posted on your Instagram feed. This is great if you want to achieve a really pretty-looking feed that’s going to wow your audience when they land on your page. Hootsuite is one of the biggest scheduling tools on the market, and hugely popular with big brands as well as small businesses. One of the things I really like about Hootsuite is that it covers a wide range of social media platforms, and because it is one of the most established tools on the market it also has good, trusted status with social media platforms. 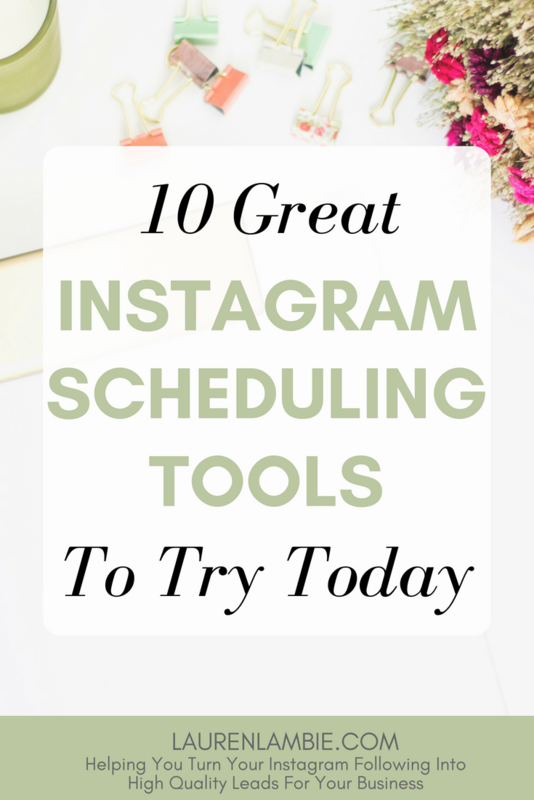 Schedugram is a specialist in Instagram scheduling so for that reason has some great features. 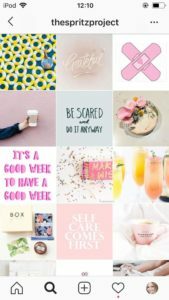 Like Planoly, is also has a visual planning tool so you can arrange the layout of your posts before you schedule them, and it also has lots of other nice features such as the ability to put your hashtags in a separate comments field rather than the caption. Iconosquare is all about their analytics. Though that might sound dull, good analytics are really what will enable your company to grow rapidly, because only data tells you what’s working and what’s not working, and what you need to do more of to grow your social media presence. Buffer is another big-name scheduler with the ability to manage lots of different social media platforms in one place. 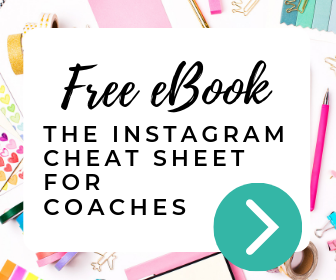 They have all the features you’d expect from an Instagram scheduling tool including good analytics to help you grow your account. If you’re already using Buffer on your other social media accounts, this could be a good option. Later also has that nice visual planning feature that is so popular for Instagram scheduling, and also has good reposting features, which means you can repost (or regram as it’s also known) other popular content to your feed (whilst crediting the original creator of course). That’s something that is becoming increasingly popular on Instagram and it’s a great way to keep your account fresh and active if you don’t have a lot of time to produce content. 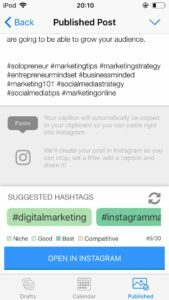 If you have, or plan to have, a social media agency, then Sendible is a good option for managing multiple client Instagram accounts in one place. They also have a really nice “content recommendation engine” which will show you popular content that you should be posting on your account (or your client’s account). Onlypult offers the standard features you’d expect, and though I’ve never had the opportunity to use it I have heard that it’s one of the easier tools to use, and simplicity is great when it comes to social media. You can also do reposts of other Instagram content, so if that’s something you plan on doing this might be a good tool to look into. 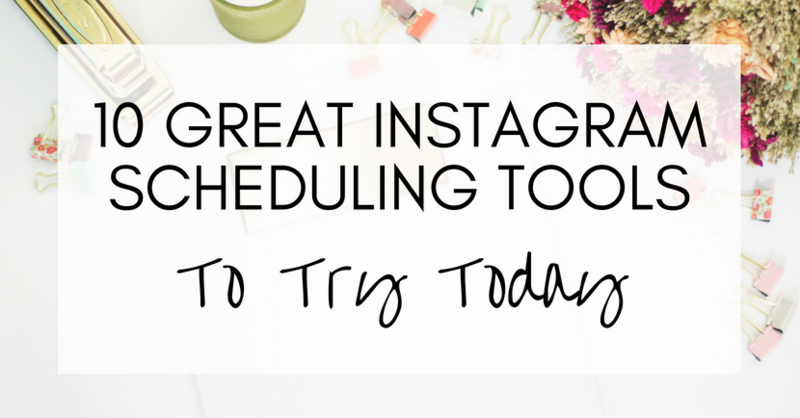 Of course, scheduling is only part of Instagram. You need to have a strategy in place to market your business. 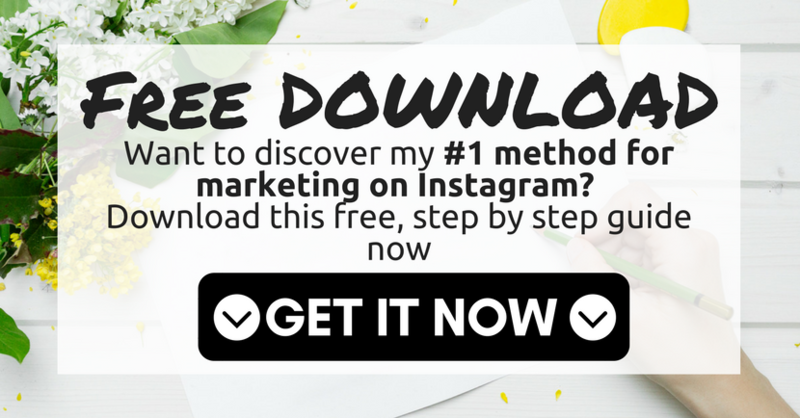 And I’ve put together a short free guide where I outline my number 1 marketing method for Instagram. If you want to grab a copy, click here for the free guide or on the image below.